Switch the VV/VW mode: Press the square button for three times to switch the VV/VW mode when the battery is turned on. In VV mode, you can adjust output voltage between 2.0V-8.0V. In VW mode, you can adjust output wattage between 5W-30W. Button lock functionality: Keep pressing up-arrow button and down-arrow button simultaneously for 2 seconds when the battery is on, then they will be locked and the screen will reflect “Lock”. Still keep pressing simultaneously for 2 seconds to unlock them and the screen will reflect “Unlock”.Through these operations, you can protect the buttons from unintentional presses and prolong their service life. Switch the display mode: Keep pressing up-arrow button and down-arrow button simultaneously for 2 seconds when the battery is off, the screen display will rotate 180 degrees. You can view the screen from two kinds of angle through this operation. Over 10s Protection: If you keep pressing the button for over 10 seconds, the output will shut off and the OLED screen will reflect “Over 10s”. Unlock the Low-voltage Protection: When the voltage of battery is above 3.7V, the low-voltage protection will be unlocked. In the end of the battery, there are two laser markers, one named “Eleaf TM” and on the other side is “iStick 30W”. On the bottom of battery, there is a laser marker named “CE” . a) Only have your iStick 30W repaired by Eleaf. Do not attempt to repair the unit by yourself as damage or personal injury may occur. b) Do not leave the iStick 30W in high temperatures or damp conditions, otherwise it may be damaged. The appropriate operation temperature is within 0℃to 45℃ while charging and -10℃ to 60℃ while using. c) Do not attempt to combine the iStick 30W with parts from other brands of e-cigarettes. If it is damaged in this way, our company will not take on responsibility and your warranty will be void. 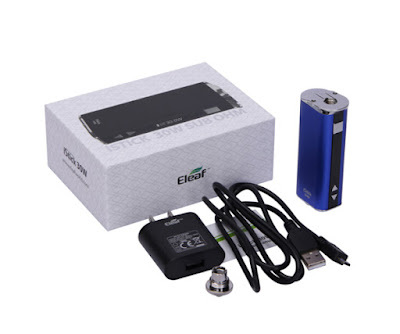 You can buy the Eleaf iStick 30W battery on Eleaf® iStick E-Cigarettes Vape Online Store.